How Far Apart Should Raspberries Be Planted? Black raspberries are pruned very differently than red raspberries. Black raspberries grow on canes that grew the previous year. Because of this, you will want to train and prune your new raspberry canes for optimal production the following year. Pruning your black raspberry bush is not difficult. By pruning the bush or bushes three times over the year, you will ensure optimal plant health and growth. Prune your black raspberries three times a year. Pruning three times a year will ensure optimum fruit production and plant health. Cut the lateral branches back to eight to ten inches in the spring. This will encourage good new growth and minimize energy and nutrient use by non-fruit-producing branches. Prune the canes back with a pair of pruning shears. Tip new canes by removing the top two to three inches of new growth in mid-summer. If you are growing your black raspberries without supports, tip them when they reach 24 inches high. Tip the raspberries with a pair of pruning shears. Prune out the canes that have produced fruit right after harvest by clipping them off near the ground with a pair of pruning shears. Black raspberries produce fruit on the previous year's growth. Your summer pruning and preparation affected the canes that will carry next year's raspberry crop. Cane is the name for a raspberry plant. Plant canes in rows that are 18 to 24 inches apart, leaving three feet between each cane. Put netting over raspberries. Use the pruning shears to trim away the top 6 inches from healthy raspberry canes. Choose canes that are firm yet moist and green in early to midsummer. Cut away any leaves from the bottom 2 inches of the stems. Leave approximately four leaves at the tops of the stems. Prepare the planting area for the cuttings. Cultivate the area lightly with the hand rake and add 2 inches of compost to the soil. Insert the bottom ends of the canes into the prepared planting area 2 inches. Space the canes approximately 1 foot apart. Use the garden hose to saturate the soil lightly. Keep the soil evenly moist for one month after planting the raspberry cuttings. Treat the raspberry cuttings as new raspberry plants after approximately one month. The stems should have roots growing beneath the soil and new foliage sprouting from the stems by this time. Provide water for the new raspberry plants if less than 1 inch of rain falls during a one-week period. Moisten the soil completely without watering to the point of puddles. Check to see if there is a cane that the raspberry leaves and flowers grow on. These canes bend over with solid roots in the ground. The color of these canes range from purple to light brown. Examine the flowers and the leaves of the plant. The leaves of raspberry plants are pointy with serrated edges, and sometimes have light hairs on the face of the leaf. The plants only bloom in late spring, and will have small, delicate white flowers. Look for the most recognizable part of the raspberry plant, the berry. It is a small, soft, easily squashed fruit that is a round shape made out of smaller circles. Small hairs are present on the fruit. The berry may be black, purple, red, yellow or white. Rinse berry vines off with a garden hose two days before you plan to prune. Rinsing eliminates, dust and spider webs and encourages pests to leave the area. Put on a long-sleeved shirt and leather gloves. Black raspberry vines have sharp thorns of two varieties: tiny thorns on new growth that enter the skin like splinters, and thorns on older canes that are akin to the rigid thorns found on rose bushes. Cut off all canes that produced fruit in the current season at ground level. Tie new canes to a trellis with twine to encourage their stability prior to the next growing season. Cut them down to 12 inches if you do not have a trellis in place. 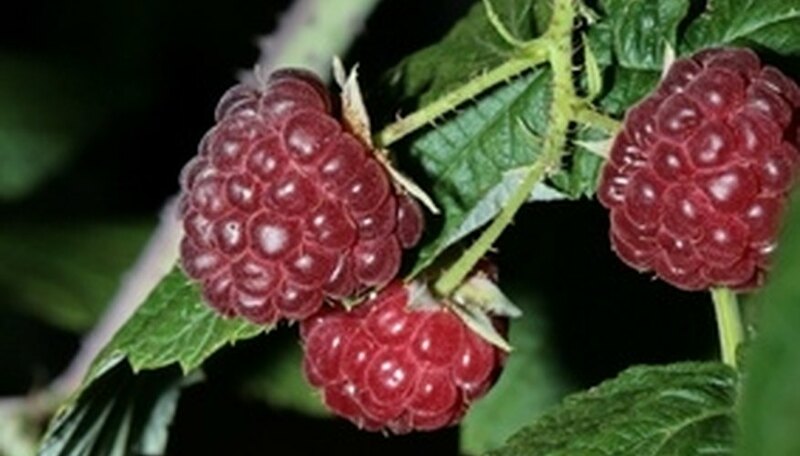 Prune your red raspberry plants in late March or early April. Wear gloves to protect your hands from the prickers found on red raspberry plants. Choose a well-maintained pair of garden shears for the optimum pruning and growth of your red raspberry plants. 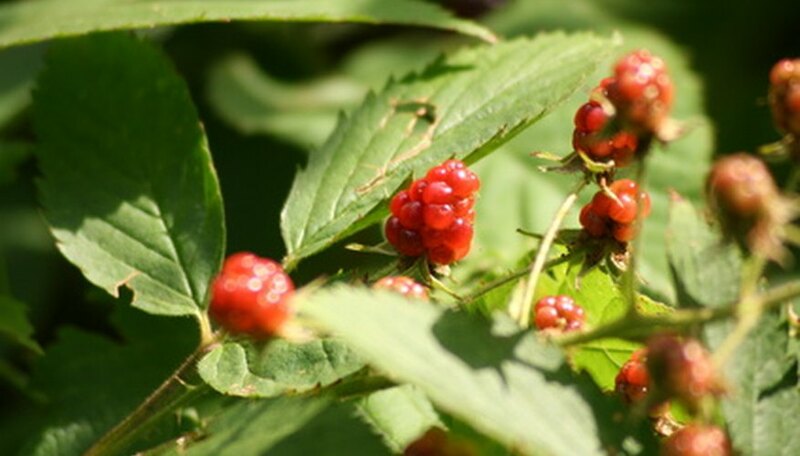 Select the healthiest of your red raspberry plants to remain in your garden. Those with a 1/4 inch diameter at a height of 30 inches are the most desirable. Prune them back to a height of no more than 5 feet. Remove all of the weak and damaged canes as well as the winter-damaged tips of any of the healthy canes. Cut the damaged tips back to living tissue. Also remove enough canes to create a distance of six inches between canes. Prune your plants again after they have produced their summer crop. Prune these canes that produced fruit back to the ground. Do this immediately after harvest and remove the pruned canes from your hedgerow to help control disease. At this time you should also thin out your new red raspberry shoots. Leave three or four healthy shoots per foot of hedgerow. Drive 8-foot 2-by-4s in the soil at the end of each row. Make sure that the posts are buried at least 1 to 2 feet in the ground. Place 6-foot 2-by-2s every 15 feet along the row. The ends of these supports need to be buried at least 1 foot deep in the ground. Wrap a heavy-duty wire around the end post 20 inches from the ground. Twist the end around the long wire to secure it. Wrap the wire around each of the middle supports and secure to the end post at the other end of the row. Repeat step 3 at 40- and 60-inch heights. You should have a trellis with two heavy-duty boards at the ends of the row with supports throughout the row. There should be three wires, equally spaced, to support the raspberry canes as they grow. Dig a trench directly under the wire that is 6 inches wide and 8 inches deep. Plant your raspberries in this trench, spaced 18 inches apart. Create new rows at 6 feet apart. This allows for the plants to bush out without interfering with your walkway. Apply 2 oz. of 5-10-5 fertilizer to each raspberry plant about 15 days after planting to give the raspberries a boost in growth. Sprinkle the fertilizer at the base of each plant and water until the ground is moist, not soaked. Mix 1 lb. of 10-10-10 water soluble fertilizer with 5 gallons of water for every 100 square feet of raspberry bushes. Apply ½ cup of the water fertilizer mixture to the raspberry plants in mid-spring, after the last frost. Water the soil until it is moist. Give the plants a second application of the fertilizer mix in the early summer or late spring. Water the soil around the plants until it is moist. Inspect the roots of the raspberry plant. Remove any broken or damaged roots by pruning them, which will prevent disease in your raspberry bed. Soak the roots for a few hours in room-temperature water if they are dry. Dig holes two to three feet apart in a tilled and fertilized row of good garden soil. The hole must be the width of the spread-out root system plus half that width again. For example, if a plant has roots that spread out in an 8-inch width, you must dig a 12 inch wide hole. The holes should be 5 to 6 inches deep unless otherwise printed on an included instruction sheet from the plant nursery. Hold the raspberry root system and spread it over the center of the hole. Carefully fill the hole in with soil around the spread-out roots. Continue planting the row of bare roots into the holes. Remove weak or damaged raspberry canes in early spring, cutting them back to the ground level. Make a clean cut with a sharp pair of pruning shears. Discard the canes away from the raspberry bed. Cut back overgrown canes that are more than 5 feet in height to a height of 4 1/2 to 5 feet. Prune again in the fall when the final crop has been harvested. Cut canes that produced fruit to the ground level immediately after harvest. Fill large pot, at least 24 inches wide and very deep, with potting soil. Soak bareroots, the roots of the bush at the bottom of the plant, of raspberry bushes in water for an hour before planting. Make a hole, about 8 inches deep, in the center of the soil in the pot. Place raspberry bush in hole in pot. Cover with soil. Place a trellis that will fit inside the pot next to the bush. Secure the bush to the trellis with twine. Secure loosely so the plant is not moved or restricted from growing. Water soil until it is well saturated. Prune branches after the first year. Prune only the branches that have produced fruit, cutting branches off to soil level with a pair of sharp shears. Mulch the raspberry patch. Apply a 3-to-6-inch layer of organic mulch, such as hay or straw, shredded bark, pine needles or well-rotted leaf mulch. Place the mulch between the rows and around individual plants. Water well. 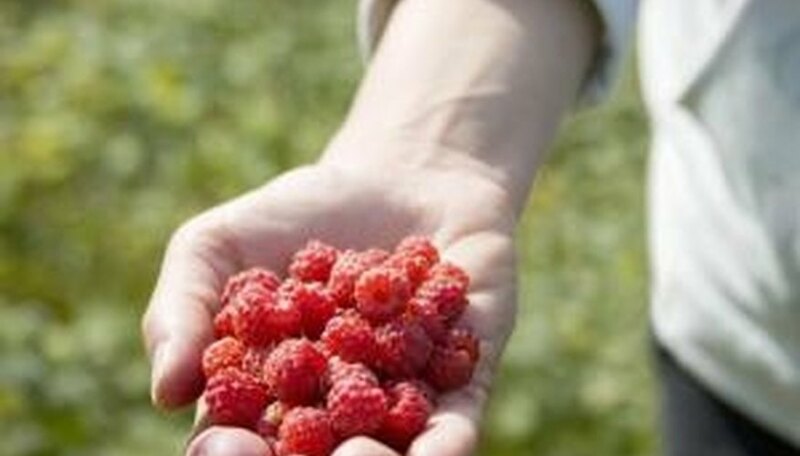 Raspberries need 1 to 2 inches of rainfall per week. If necessary, supplement rainfall with a soaker hose, which has small holes along it. The water gradually seeps out, watering only the roots. Do not use an overhead sprinkler; this is an invitation to pests and diseases. Fertilize yearly. Apply 20 lbs. of fertilizer labeled 10-10-10 for each 1,000 square feet of your raspberry patch. Apply the fertilizer in two stages: half in midspring and the second half six to eight weeks later. Trim canes to maintain the rows at 12 to 18 inches wide at ground level. Remove any others. This helps increase yields by letting air and light in along the length of canes. Trim off the tips of all new shoots when they are 30 inches high. Near summer's end, lateral branches will grow from these canes. Berries will form on them the following summer. Remove all fruiting canes after the fruit is harvested. Cut them off about an inch above ground level. Prune in spring. Cut lateral branches formed the previous summer so they each contain at least two but no more than six buds each. Remove any vertically growing canes that are less than 1/2 inch in diameter. The soil with the ideal acidity level for raspberry plants is that with a pH of 5.8 to 6.5. Always test the pH level of the soil before changing the acidity. It is possible to create a soil that is too acidic or too alkaline for raspberry bushes. Raspberry plants enjoy plenty of organic material mixed into the soil. Work at least 1 inch of organic matter into the top 4 to 6 inches of the soil before planting. Organic materials that are suitable include lawn clippings, rotten leaves or animal manure. Improve the soil fertility before planting by adding slow-release fertilizer in the top 6 inches of the soil. Use 3 pounds of 10-10-10 fertilizer for every 100 square feet of planting area and immediately water the fertilizer into the soil. Plant sparingly. Raspberry patches spread like wildfire, so avoid planting too many in one area. If you only have a few areas with raspberries the first year, the following year you will have at least twice as many plants. Create a raised bed for your raspberries. Raspberry plants are prone to root rot, so if your garden is not already raised, add several pieces of plywood on each side of the area where you would like to plant your raspberries, and fill this area with a mixture of 4/5 topsoil and 1/5 sand, manure and peat moss to promote drainage. Plant raspberry plants in the early spring, after the last winter frost. FineGardening.com recommends soaking your raspberry roots in 1 qt. of water with 1 tsp. of B1 solution added. Let the roots soaking in this solution for six hours, then place the plants directly into the soil, and cover them just up to the roots. Give support to your raspberry plants. Place a T-bar trellis, or two pieces of plywood nailed together to make a T shape, into the ground next to each raspberry plant to allow it to grow against the trellis. Prune darker growth away to make room for newer growth. Older raspberry stems that will no longer produce fruit are darker and rougher. Prune them with pruning shears 2 inches above the soil line. Leave green or light brown stems alone until they stop producing fruit. Choose a planting location with full sun and well-drained soil. Weed the area well and add 4 inches of compost per square foot of soil. Work the compost into the soil to a depth of 5 inches. Cut back the red raspberry plant you wish to transplant to 6 inches from the ground. Remove all foliage. This will reduce stress on the plant. Dig up your red raspberry plant with a shovel. Dig around the plant by 1 foot to avoid upsetting the roots. Loosen the soil until the plant can be easily lifted. Dig a hole for the transplanted red raspberry plant 2 to 3 inches deeper than the roots and three times as wide. Place the red raspberry plant in the hole and fill the hole with soil. Water until the soil is moist. Place bare roots (any growing medium has been removed) in damp sterile soil. Do not soak the soil in water, too much water while shipping will cause roots to rot. Wrap the roots and sterile soil in plastic wrap. Wrap them snuggly, taking care not to crush the roots bringing the plastic wrap up around the base of the plant. Secure plastic wrap with jute twine. Place a damp paper towel into a large Ziploc-type bag. Place the entire plant into the bag and seal. Write the name and variety of the Heritage raspberry plant on a label in marker. Place the label on each bag. Put priority box together and place a 1-inch layer of packing peanuts in the bottom. Carefully place one bag in the box and add another layer of packing peanuts. Leave room at the top of the box for a last layer of packing peanuts. Seal the box tightly with packing tape. Use Priority Mail to ensure a fast, safe delivery.